On The Road Again Article: People choose to become highway drivers for a lot of different reasons. There is just something about big rigs, a big sky and an open highway. It’s like a calling. Those who choose truck driving for a career are usually lucky enough to love their jobs. They are happy with what they are doing and not everyone can say that about their work. The driver we are profiling today is one of those guys. He just can’t picture himself doing anything but driving a truck…something he decided as a kid and the fascination is still with him. Meet Scott Gardner…Scotty to his friends. Scott came to work at PDI in 2013. He trained with senior driver Bob Schofield. Scott is a 25 year veteran behind the wheel. He works out of the PDI dry bulk Massey Road terminal in Guelph. The truck he drives is T-132 a 2013 Kenworth with 590,000 kms on it. It was just a baby; five months old, when he started driving it. Scott drives long haul so T132 has a bunk. 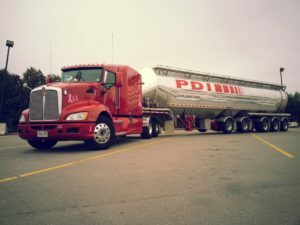 Scott says that driving Montreal and the Border States from Guelph isn’t really long haul to him considering some of the travel he has done in his career, but the work he does at PDI suits his lifestyle. Scott mainly hauls bulk plastic polymers; both pellet and powder forms. He is trained to self-load the products from rail cars. He is also trained in the Liquid Division hauling non-hazard liquid products. Scott has hauled a lot of PAO40 an Isoparafinnic Polyalphaolefin, PAO100 a high viscosity poly alpha olefin fluid and Polyol out of Buffalo. Polyol is an oil based mixture used in the manufacturing of foam for car seats, office chairs, etc. T132 is Scott’s regular truck. He doesn’t share it with anyone. He is really proud of T132 and he likes to keep it clean and well maintained. Scott’s hobby is photography and he takes many pictures of T132; some included in this write-up. Scott even won a local trucking contest with T132 and had the fenders he won installed on her. Scott has hauled all the PDI trailers: tandems, tri’s, quads, 5 axle, and container chassis. Cross border on a tandem, he can haul 80,000lbs legal US and 87,000lbs legal in Ontario. Scott is well trained on cross border trucking, including eManifests and Bill of Ladings with PARS stickers, etc. He currently does not have a FAST card; feels he doesn’t need it anymore because everything is so computerized at the border crossings. Scott’s regular dispatcher is Michelle Wright. Michelle is fairly new to dispatching, having transferred from the shop parts department. Michelle uses T-132’s Peoplenet GPS tracking and information system unit to notify Scott of his loads. Most of the work Scott does allow a large window of opportunity for delivery. Loads have scheduled times, but the driver has the freedom to work within the window, as long as the load is delivered on time. He is also backed up in Administration by our Customer Service Reps (CSR’s). 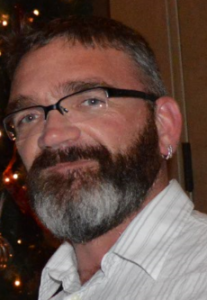 Scott’s main contacts are Senior Lead CSR Janice Walker or Tiffany Aldrich, but he says he deals with all the CSRs over the course of his work. 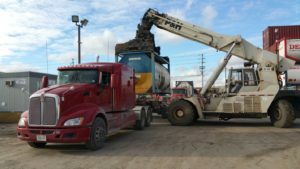 So what was the career path that led Scott to PDI and the dry bulk tanker world? As a young kid, he spent summer holidays riding the west coast in a truck with his step-dad. At 16, he started loading trailers in the warehouse and shunting for Liberty Linehaul and the company helped him get his AZ class from Markel in Aberfoyle. He even used one of the Markel trucks to do his test. Like most professional drivers, his first trucking job was hauling general freight in a dry van locally. He moved on to the Montreal runs for three years and at 24 years old he changed jobs and worked for J&R Transport out of Ayr running dry van in western Canada. From there he learned cross border US runs and moved to Vancouver for a year. He dispatched for J&R for six months while in Vancouver, but preferred driving the truck rather than telling others where to drive. In 2009 Scott bought his own truck; a 1999 used Kenworth T600. He worked it for Ranlyn Trucking running Triaxle reefer to the Montreal corridor. He also ran concrete pipe on 5 axle flat beds with Braniff Trucking out of Cambridge. He acquired his own operating authority with his own insurance as Mackenzie Express; named after his daughter. Mackenzie Express saw a lot of trucking, including moving rolls of tight steel coils on 5 axle flat beds and oversized loads out west. He also worked for Liquid Cargo hauling white oil and liquid asphalt. After seven years, Scott sold the truck and went to work for Scotlynn Transportation on a lease-to-own of a 2013 Peterbilt hauling reefer produce to California. With a young daughter, Scott felt the work was taking him too far from home. He was living in Cambridge and came to work for PDI in February 2013. It takes years to become a good driver like Scott. He feels good drivers really need to pay attention when you are on the road. Good drivers know their equipment and have respect for the road and the weather conditions. He recommends that drivers not drive out of their comfort zone…if it is snowy or icy and you are comfortable at 70kph, drive your comfort zone. Personally he hates driving in fog and would rather drive in a snow storm in the Rocky Mountains than face the 401 on a foggy day. He actually likes winter driving in a truck and says it challenges your driving experience and capabilities, even if he does drive a little slower the older he gets. Safety is a huge factor for drivers. Apart from the day-to-day challenges of being on the road and in traffic, tanker drivers face other challenges when unloading. Scott warns to always make sure the pressure is out of the trailer before removing anything. The blow down valve located at the front driver side of the trailer needs to be open before unloading and make sure your gauges are reading zero. Always stand to the side when opening caps, or removing hoses. That way, if there is some pressure left in the tank, you will not get hurt from a cap or hose coming off under pressure. Starting his work day between 4:00am to 5:00am begins with a proper circle check. Tires are inspected to make sure there are no gouges or chunks missing…kicking them to ensure they are not flat. Ensure wheel rims have no cracks or stress marks and all 10 wheel lug nuts are in place. Scott makes sure nothing is missing on the truck or trailer and opens the hood to do a visual check of belts and verify there are no signs of fluid leaks. This is followed up with a light check and walk around to ensure they are all working and an inspection of the overall appearance. Scott ensures hoses are in the hose tubes and the right amount of hoses are with the trailer. At the customer he will check the hoses for cracks or breaks that may cause difficulty unloading. These days Scott’s most important job is being a dad. And just like that job, it would seem that he was destined to be a driver too. Driving fits his family life and he likes the people he works with, socializing with other drivers and chatting with shippers and receivers. It helps having his own schedule and taking breaks when he wants to. He knows the company and the customers trust him to be responsible for his load and safely meet delivery targets. Scott likes the freedom to be on the open road and couldn’t imagine working in an office or an assembly line where the work is mundane. Besides, Scotty says he just plain likes trucks!